This site is for Fire Police in New York State and is managed by Fire Police in the State of New York. VFPASNY Award nominations are due by no later than March 31, 2019. Revised forms are available via links on the AWARDS section or from the Files section. The Office of Fire Prevention and Control's Investigation Branch recently investigated a fire that originated within the cargo area of a law enforcement vehicle. The investigation concluded that road flares, stored within that area, were ignited the result of inadvertent contact between the striker (red phosphorous) and ignition button of separate flares. The "Move Over Law" has been expanded to include vehicles displaying blue and green lights. 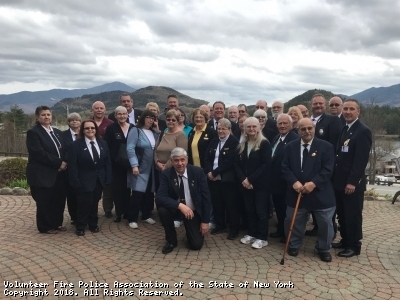 A formal legal opinion can be found in the "General Information" section of the "Files"
The 2017 Annual Convention was held at the Crowne Plaza Hotel in Lake Placid, NY. Congratulations to the new slate of Officers. The complete listing of Officers has been updated in the Officers Section. 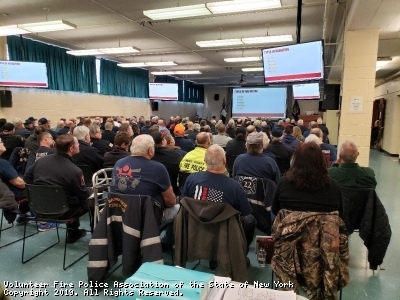 The Annual Thomas F. With Fire Police Training & Education Seminar will be held at the NYS Fire Academy in Montour Falls, NY on March 16, 2019. The Tom F. With Seminar drew quite the crowd and covered several key topics. Tom F. With opening the seminar. A packed house at the 2019 Tom f. With Seminar. This section will be used to list upcoming training in the various regions. If an associated flyer was received, you can look in the File tab on the left side of this page and find it there. If there is no flyer, all the available information will be on the Calendar. Please click on the date in the calendar to obtain any available additional information. Note: Seats are limited, pre-registration required - Contact SCFA in advance to register (registration is available 60 days prior to the event) -Pre-Requisites: ICS 100 and ICS 700. Wednesdays at 7:00 pm - February 6, 13, 20, 27, and March 6 with the last hands-on training class at 9:00 am on Saturday, March 16 at Suffolk County Fire Academy. Wednesdays at 7:00 pm - April 2, 9, 16, 23, and 30 with the last hands-on training class at 9:00 am on Saturday, May 5 at Suffolk County Fire Academy. Wednesdays at 7:00 pm - July 2, 9, 16, 23, and 30 with the last hands-on training class at 9:00 am on Saturday, August 10 at Suffolk County Fire Academy. Wednesdays at 7:00 pm - September 4, 18, 25, October 2, and 9 with the last hands-on training class at 9:00 am on Saturday, October 12 at Suffolk County Fire Academy. The Committee list has been updated for the 2018 -2019 year. Please check it to verify any committee that you may be on. Please click on the date in the calendar to obtain any available additional information about the event. As of July 17, 2018 the VFPASNY has a New Deceased Membership Notification Forms and they are available under "Files", Please discard any other forms. If you want the new Deceased Member Form in PDF format click this link! If you want the new Deceased Member Form in WORD format click this link! As of July 12, 2018 the VFPASNY has a New Membership Applications and they are available under "Files", Please discard any other membership application. If you want the new Member application in PDF format click this link! If you want the new Member application in WORD format click this link! All Membership Applications are to be sent directly to our newly Appointed Membership Secretary Jon Wicks. The Legislative Issues of United Concerns affecting the Fire Service can be found in the Membership section of the Files Section. The 50 years Certificate application have been updated. An article about the ANSI Regulation being made easy is in this section. The application form for membership in the Ladies' Auxiliary has been added. The information for all three awards available to be given out at the Annual Convention is in the files section. A suggested Oath of Office is in the files section. You will find all the forms under the "Files" section. Unfortunately, I cannot change the title "Files" to "Files/Forms" but please be aware that all forms are listed there. There have been several inquiries concerning training to become a fire police officer. This is a certified New York State course offered through your local County Coordinator. Please have your fire chief contact your County Coordinator's office to ascertain when and where the next course will be given in your county, If you still need assistance, you can look in the "Files" section to see which Area you reside in and contact the Director for that Area using the "Officers" section. Please send all calendar events, forms, notices to happyhare4@aol.com. All calendar events will be added as soon as they are received. 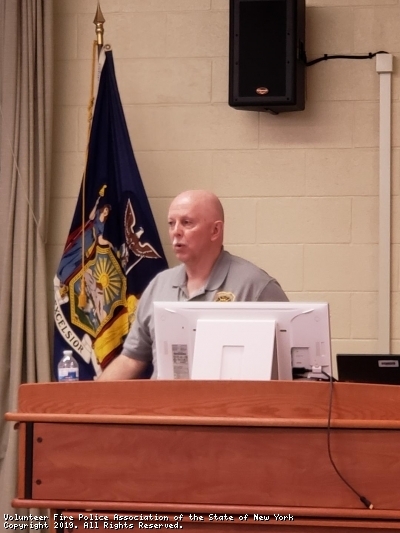 The mission of the Suffolk County Fire Academy is to provide the most cost effective, up to date Fire Training available to its customers, the volunteer firefighters, career firefighters and emergency responders of Suffolk County. This site has been viewed 164,251 times.